Evidently the Trump administration’s demand for regime change in Venezuela was not a spur-of-the-moment decision. It is part of a long-range plan to remake Latin America, along the lines of the failed plans to remake the Middle East. Other targets are Cuba and Nicaragua. At best, this will result in increased misery for millions of people who have never harmed or threatened us Americans, and an increased flow of refugees. At worst, it will result in all these things, plus an increased Russian and Chinese presence in Latin America. By ‘deep state,’ I mean all the U.S. military, intelligence and covert action agencies that set their own policies and operate out of sight of the U.S. public. Venezuelan Coup Attempt Part of US Plan to Remake Latin America by Yves Smith for Naked Capitalism. The Making of Juan Guaidó: US Regime-Change Laboratory Created Venezuela’s Coup Leader by Dan Cohen and Max Blumenthal for Consortium News. Sanctions Are Wars Against Peoples by Moon of Alabama. Every time a U.S. President targets some nation as an enemy, and tries to drag other countries into the conflict, he creates the possibility of a backlash. Why the push for ‘regime change’ in Venezuela? 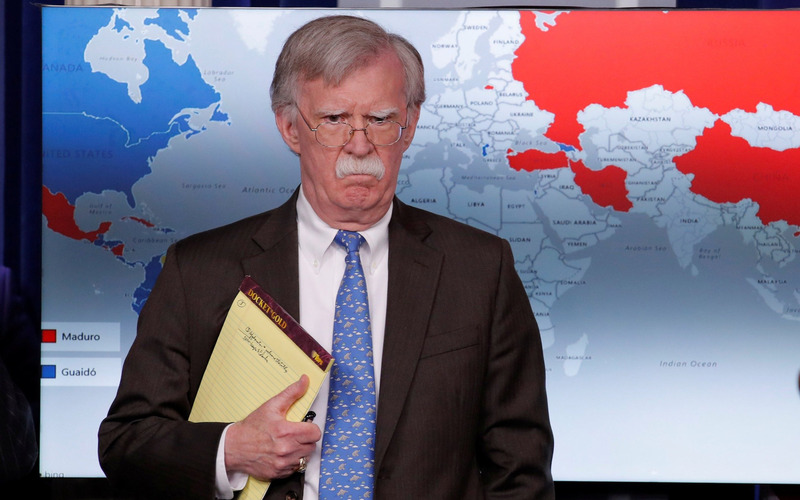 National Security Adviser John Bolton explains U.S. Venezuela policy. I think I’ve seen this script before. The unpopular ruler of an oil-rich country cracks down on the opposition. The U.S. government sees an opportunity and tries to bring about a change in regime. What can go wrong? In Iraq, this led to an inconclusive quagmire war in which thousands of Americans and hundreds of thousands of Iraqis lost their lives. In Libya, it led to the collapse of civil order, leaving Libyans worse off than before. In Syria, it led to another inconclusive war, benefitting no one. The chief result of these wars was the European refugee crisis. Now the U.S. seems to be playing out the same script in Venezuela—doing the same as before and expecting a different result. 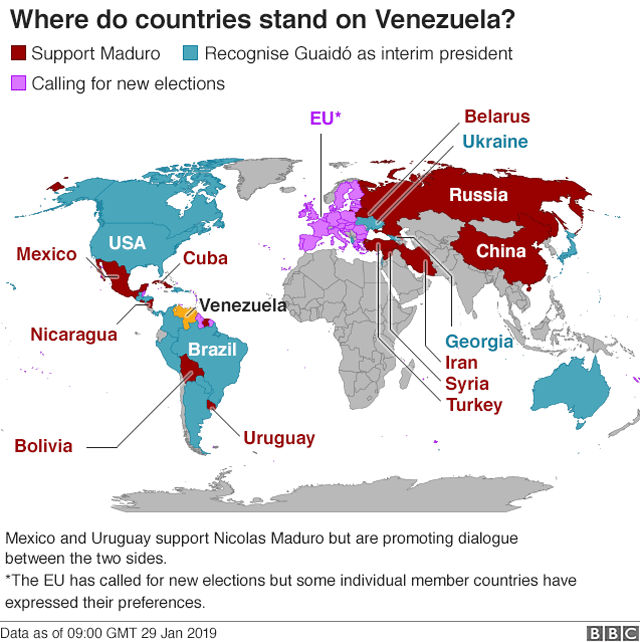 The Trump administration has recognized Juan Guaido, the leader of the National Assembly, as the legitimate president of Venezuela, and called for the overthrow of President Nicolas Maduro. Guaido is indeed the leader, but that’s because the leadership is rotated among the parties, and the Trump administration’s decision happened on his watch. To support Guaido, the administration has blocked Venezuela’s oil company from collecting revenue from its oil exports. Instead the money goes into a blocked account until Guaido takes power. As far as I’m concerned, this is a pass-fail test of political leadership. Only those who oppose intervention are lovers of peace. So far Bernie Sanders passes this test, as do Democratic Reps. Tulsi Gabbard, Ro Khanna, Ilhan Omar and Alexandra Ocasio-Cortez. The U.S. government engages in regime change, which is much more than simply interfere in foreign elections. Just in the past 20 years, it has invaded Afghanistan and Iraq, funded foreign fighters to attack governments of Libya and Syria, and supported military coups in Honduras, Ukraine and Venezuela. The coup in Venezuela failed, so the U.S. government uses economic warfare instead. In 1996, the U.S. State Department engineered the election of the unpopular Boris Yeltsin. He disbanded the Russian parliament, took over Russian TV and used all the techniques later used by Vladimir Putin to stack elections in his favor. Time magazine actually ran a cover story hailing the U.S. success. The results were that he crashed the Russian economy for the benefit of a few corrupt insiders, and destroyed the possibility of U.S.-Russian friendship for a generation, maybe longer. 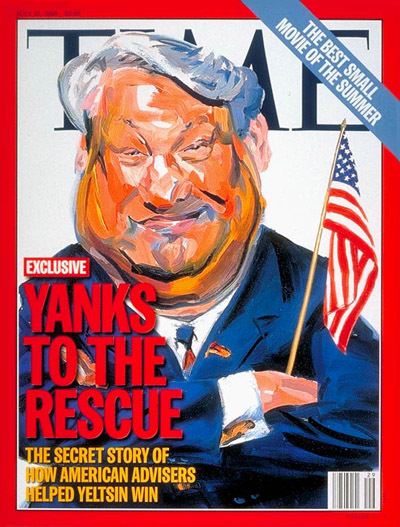 “Yanks to the rescue”: Time’s not-so-secret story of how Americans helped Yeltsin win 1996 presidential election from OffGuardian. Currently many foreign-backed NGOs operate in Russia. Their stated purpose is to promote democracy and freedom. Many get funds from the U.S. National Endowment for Democracy, which is funded by the U.S. State Department and private philanthropists. Some are supported by billionaire George Soros. It is possible that most of them or maybe all of them, are doing things that I, as a believer in democracy, would approve of. If so, I can understand why Vladimir Putin might not think so. I have no way of knowing what, if anything, the CIA is covertly doing to spread information or disinformation in Russia. Russia Expels USAID over ‘political meddling’ by Deutsche Welle. The Mueller indictments have convinced me that Russian intelligence services probably did disseminate confidential e-mails from the Democratic National Committee and Clinton campaign chairman John Podesta, that certain Russians used social media to comment on the election and that Russian intelligence agencies tried to gain access to voter registration rolls. I think there are a lot of other things that had much more influence on the election that this. The question is: What happens if and when the Russian covert agencies try again? I don’t believe in “moral equivalence,” if the meaning is that, just because the U.S. government has done bad things to other nations, we Americans should sit back and let them do bad things to us in return. Neither do I believe that we get very far by saying “you are bad, we are good, so you should stop doing certain things while we keep on doing them ourselves.” It would be very interesting to see if U.S. intelligence agencies would be willing to sacrifice their manipulations of foreign politics if that would safeguard the integrity of our own. Americans can spot election meddling because they’ve been doing it for years by Owen Jones for The Guardian. Russia Isn’t the Only One Meddling in Elections | We Do It, Too by Scott Shane for The New York Times. Can the US bring about ‘regime change’ in Iran? The pattern would be the economic war the U.S. government has waged against Venezuela, which has crashed that country’s economy and created desperate poverty. Top members of the Trump administration have long been committed to overthrowing the Iranian government. But they’re not going to get the American public and Congress to support war with Iran. What’s left is covert warfare, subsidizing dissidents and rebels in Iran, and economic warfare, using U.S. financial power to punish businesses that do business with Iran. Because most international trade is done in U.S. dollars, and because most transactions in dollars go through U.S. banks, the U.S. government is in a position to do great damage to businesses and business owners that displease it. Is there hope for peace in Syria? renunciation of “regime change” as a U.S. goal in Syria, because you can’t negotiate a peace with someone while you are openly bent on his destruction. Secretary of State John Kerry has said some things that indicate the United States might be willing to work with Vladimir Putin for a negotiated peace. I hope this is so. U.S. policy under President Obama has been marked by a steady drift toward war, interrupted by sudden lurches toward peace, as with the Iranian sanctions negotiations. Almost all the Democratic and Republican candidates are worse on this issue than the current administration. Hillary Clinton is a war hawk. Bernie Sanders says that the destruction of ISIS should take priority over removal of President Assad of Syria, but removal of Assad should remain as a long-term goal. The Republican candidates are all over the map. I regret having given Donald Trump and Ted Cruz credit for certain glimmers of sanity when in fact they have no coherent policy. The one voice of sanity is Senator Rand Paul of Kentucky, who is a clear and principled opponent of regime change, but has little chance of winning the GOP nomination.